It’s a warm (Eng. translation: not cold), windy Tuesday. The washing is on the line. The mother-in-law’s house is quiet, everyone is out. Everyone except me. Short of streaking through the house, bosoms flapping like wings, shrieking “I’m freeeeeeeeeeee”, I am enjoying a rare moment of indulgence. I have no appendages: the husband is on parental duty this afternoon and the mother-in-law is meditating for the Master’s birthday (the Master is not, as you may assume, a pet-name for the on-off psychotherapist boyfriend, he is her Guru). Because of this, Ian – the mother-in-law’s friend-slash-gardener – did not come on his usual Tuesday round and I do sort of miss the sound of he and the mother-in-law hacking through the wilderness that is the garden, in between breaks for strong coffee, paper-weight heavy tea loaf, and catching up on the Brandon Hill community goss. So for today, the garden is mine too. On Sunday, I noticed a huge clump of stinging nettles bursting forth beneath the wonky palm in the garden, and nettle soup came to mind. It does sound a touch trite and so, well, Second World War but today I thought I’d give it a go (especially as I’m on a bit of a mission to use and grow as much as I can from the mother-in-law’s garden). I mean, it can’t be that bad – I have at least two recipes for the dish in my cookery book collection. 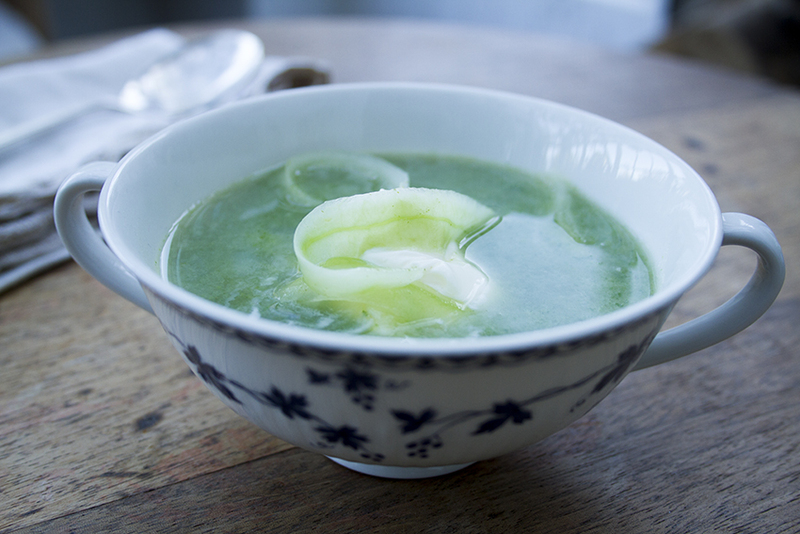 In their second and most excellent installment about nose-to-tail eating (‘A Kind of British Cooking: Part II‘), Fergus Henderson and Justin Piers Gellatly offer a recipe for ‘Nettle and Snail Soup’. I utterly respect the nod to tradition, the commitment to sourcing from ye backyard, and that the final aesthetic could resemble a beautiful English garden idyll in a bowl, but these are a crouton-too-far for me; in my head the snails are tiny, inedible lilos, bobbing their way around an algae-green pond. Should there be another era of rationing I may change my mind but, for now, I just cannot bring myself to eat snails. I’m sorry. In a bid to counter-balance these peculiarities, my recipe uses one large potato and no faffing about, and thus I hope pleases both camps: that supporting watery soup and the other, team baby-food. Now to the main ingredient: you may question the use and ingestion of stinging nettles (I don’t blame you – the plant’s common name doesn’t bode well for hinting at the pleasure and nutrition within its eating) but I tell you now, these are some of the most pleasant and delightfully subtle greens you can eat, they’re very good for you (a rich source of protein, vitamins A, C, potassium, manganese, calcium, and iron), and they’re free for all in their abundance. Now for the foodie bit: like spinach, stinging nettles are incredibly iron-rich (making this a perfect vegetarian alternative to chicken soup) and thus share an affinity with the flavours of garlic and lemon (and nutmeg but I don’t use spices in this recipe). 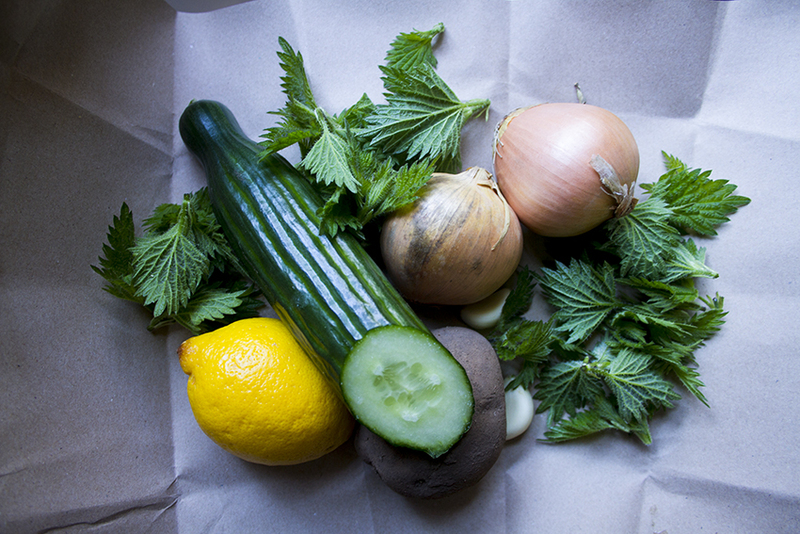 My recipe also includes cucumber, quickly soused in lemon, to add some crunch to the soup (where regular or animal croutons may ordinarily be used), match the coolness of the nettles, and add a little sharp note. Cut in ultra-fine ribbons it takes on a sort of loksheny role, even if it does look pretty fancy schmancy (especially atop a dollop of crème fraîche or yogurt). This soup is very quick to make and serves 4-6 people, depending on the generosity of the cook/the appetite of the diner. Having collected your young stinging nettle tips, wash them thoroughly (with gloves on!) and set aside. 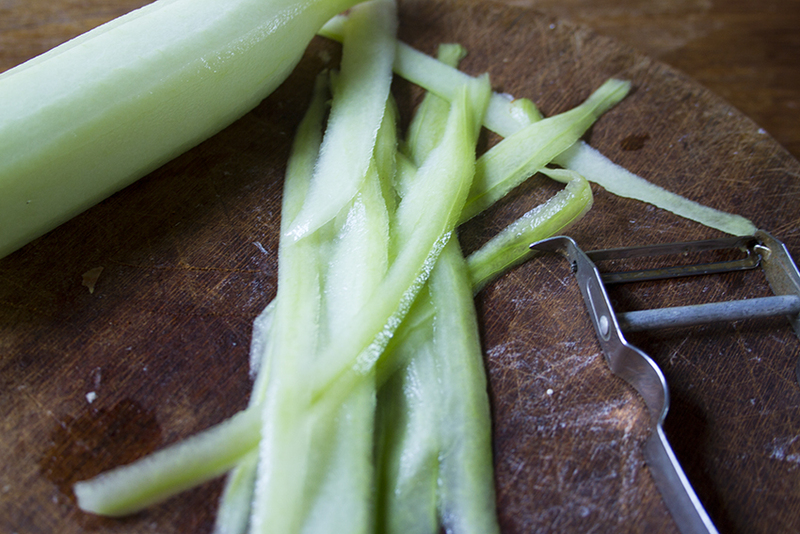 Peel your cucumber and – using the peeler or a mandolin – cut very fine strips until you get to the seeded core (which you should either eat or compost – please don’t throw it away). 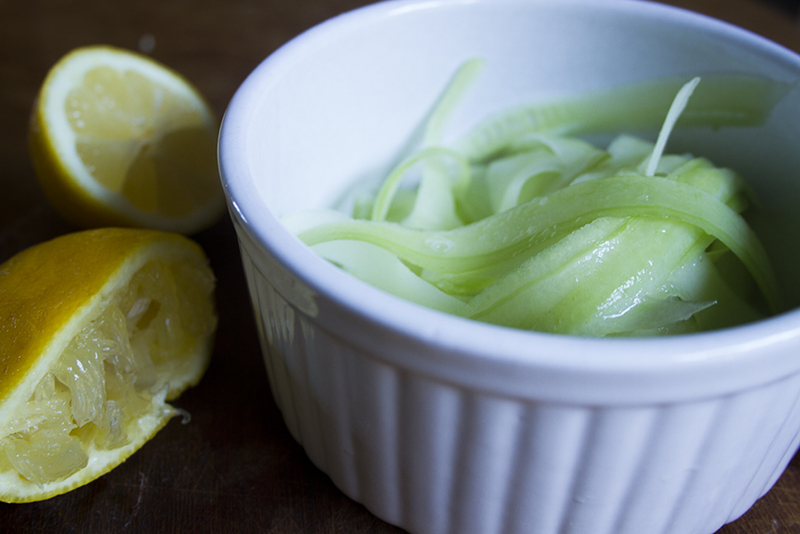 Place the strips into a bowl, add half the lemon juice and give it all a good stir. Refrigerate until serving. 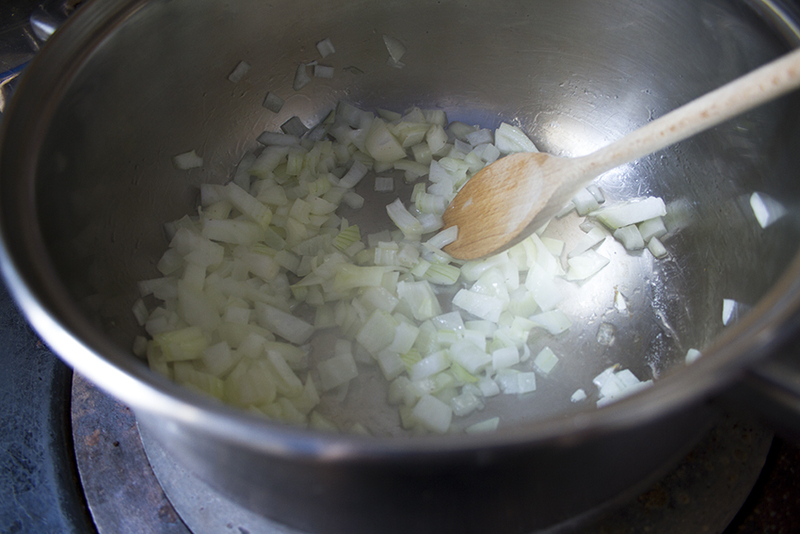 After about 10 minutes, and when the onions are soft and translucent, add the garlic and soften for a couple more minutes. 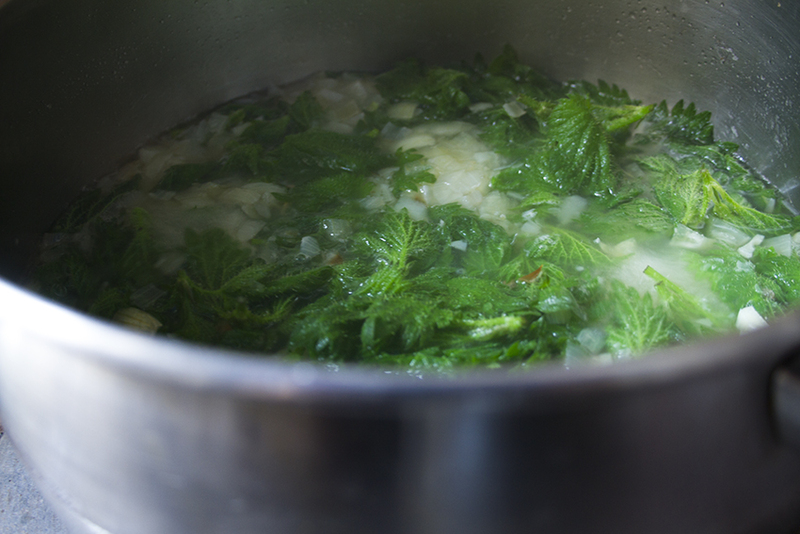 Now add the nettles, stir in the pan for a minute or so, and then pour in the cold water. Turn up the heat a bit and bring the pan to the boil. Once boiling, turn down to a simmer and cook for a further five minutes. 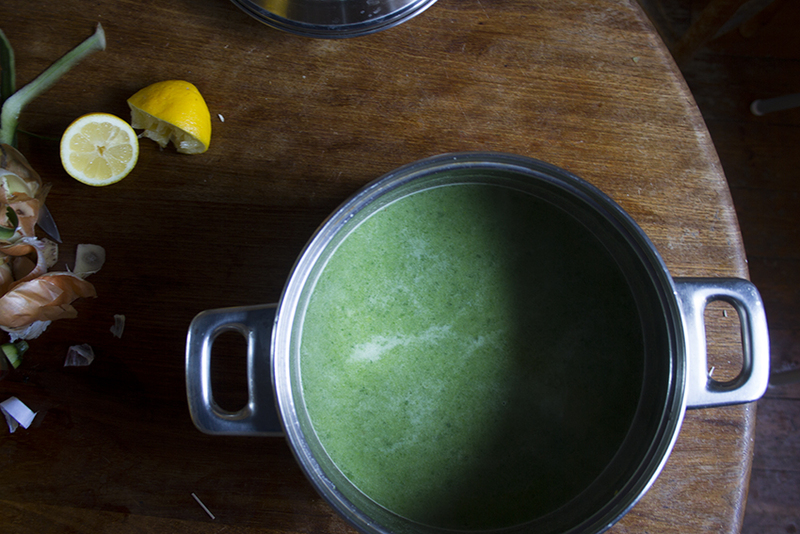 Remove from the heat and cream the soup using a hand- or stand-alone blender. Add the remaining lemon juice, and season with salt and pepper. Serve this soup hot or cold and with or without a spoonful of crème fraîche or yogurt on top, and garnish with the soused cucumber. 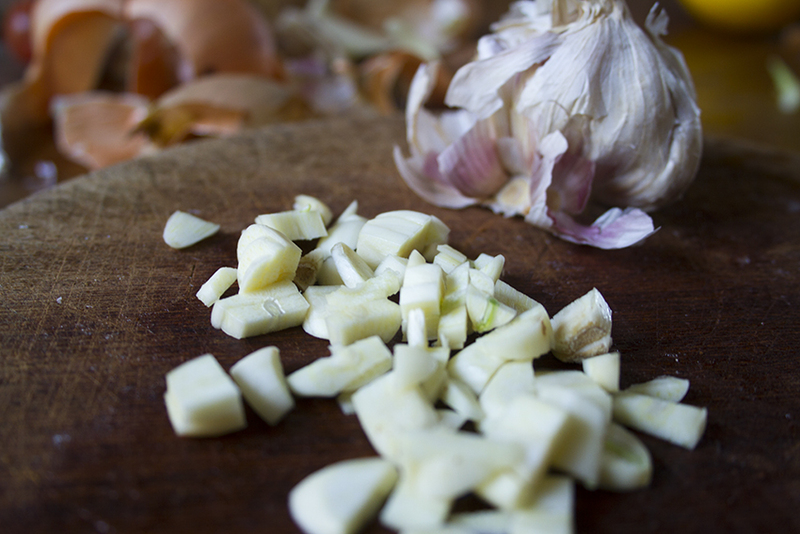 Soused – a quick way of pickling, commonly using vinegar and a blend of spices and herbs. Loksheny – my own made-up adjective from the noun, lokshen, meaning Jewish egg noodles. Use it to describe something as a bit noodly. Fancy schmancy – with the addition of the Yiddish prefix ‘schm’, this term is somewhat dismissive of the fancy bit. Sarcasm, Jewish style. Faffing about – to my surprise this is not a Yiddish term. But it is just as fun to write and say out loud. 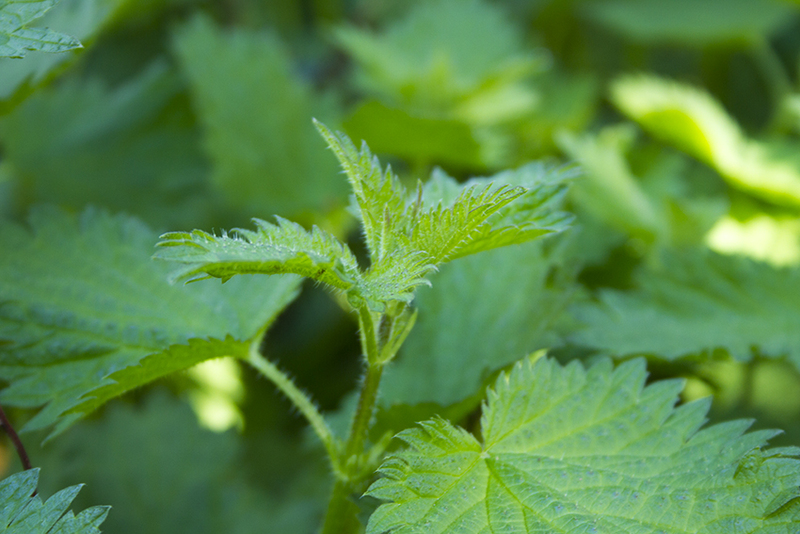 You can wow your little ones with an experiment: steep some nettle leaves in hot water, then squeeze in a bit of lemon juice, and watch the liquid turn from green to pink. It’s all about the pH, man. Here’s a little clip to illustrate how.